These place card holder is an effective means of designating seats at a bridal shower, party, or special event. The wedding favors are available in several different sizes and designs for best accommodating the placecards. Why use a place card holder at the table? Assigning seats at a party or special event ensures that attendees with common interests and goals are able to sit together. 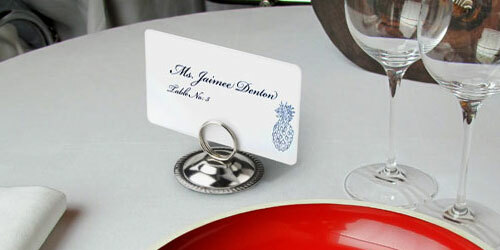 Place card holders can be added at every place setting to assign each guest to a specific seat or numbered table. Wedding favors used in this way ensure lively conversation so that guests can have an enjoyable experience. The place card holder is the best tool to use to eliminate that awkward feeling guests have when they aren't certain where to sit. The holders for placecards make for great party favors. Shop this online catalog to see the numerous place card holders that are in stock and ready to ship today! A place card holder is a small table stand that can be positioned on a tabletop or other flat surface. While it takes up very little space, the placecards are elevated so they can be easily seen during the course of the event. The place card holder is made with strong steel wire with a metal or a resin base. Customers will experience the same level of durability whether the design is traditional or fanciful. Positioned on every table, the wedding favors will capture the attention of each guest at a wedding, themed party, or corporate event. The frame can be used as a keepsake that guests can use to hold photos at work or home. 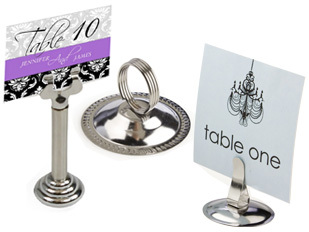 What are some of the benefits of using these table number stands? Place card holders help to limit some of the confusion at large social gatherings. Guests will not awkwardly wander through the venue because they do not know where they are sitting. Every attendee can feel confident knowing precisely where to sit. Tabletop displays help to ensure that the correct guests sit together. Make guests as comfortable as possible by sitting them with people they are likely to get along. Party place card holder sets are affordable accessories used by planners to direct guests, promote products and services at charity events and other public meetings. What types of table accessories are offered here? Wedding and special event photo accessories can be quaint or elegant. Whimsical placecard holders are used at weddings, anniversary parties, retirement celebrations, and other social functions. 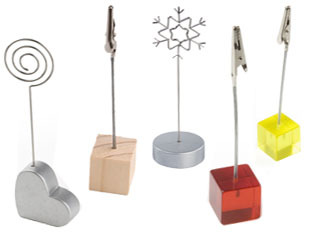 They feature clasps or bases that are sturdy wire stands with resin bases or holders. Each wedding placecard stand may feature a resin flower, heart, star, or butterfly. Customer can welcome to pick the model that best fits the event. A heart or flower number clip is often used for a wedding event. The star shaped table accessory is a great option for awards banquets. These products are sold in a wide variety of colors. With the low price points, many hosts are willing to let guests take the displays home as a keepsake! An elegant placecard holder is often used at a wedding, charity dinner, or other social event. Perfect for formal occasions, table number stands feature a sturdy steel wire post with a simple yet elegant top design and scrolled base. There are decorative tripod models that provide stability on the tabletop. Use a number stand to show every guest where to sit, display a photograph of the happy couple or a themed photo at a charity event. Provide guests with detailed information about the charity. Are you commemorating a historical event? Display photos or facts that highlight the event. Basic table decorations often feature a durable base with a simple wire stand that uses one or two sign holder coils or alligator clips at the top to hold name cards, messages, or table numbers. Seen virtually everywhere, these fixtures sit on a table but attract little attention to the stand itself. Attention is focused on the guest name, photograph, or message while not detracting from the other decorations on the table. Peruse this online catalog to see our low wholesale prices and quantity discounts! 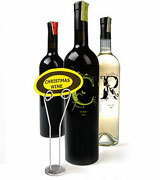 Sign holders come many different sizes and style that will fit the setting. Find a design that compliments the overall décor. They can be set on a table or feature an alligator clip that will attach to displays at restaurants, bakeries, and other retail locations. The alligator clip will clasp tightly onto the content. They can even be used at weddings to mark the location of the gift table! Reserved table decorations include this standard display that features a small base with a coil elevated by a wire as well as various styles that sit low on the table. 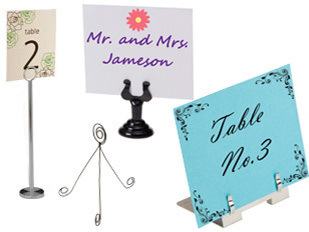 These event accessories are perfect for reserved signs and table numbers. The displays are very helpful to guests trying to find their seat. A card holder is a low-cost display tool that everyone can afford. With a wide array of holders to choose from, shoppers are sure to find one to fit their budget. Many of these table number holders are sold in sets of fifty. Other models are packaged individually, so customers can buy one or 1,000s. There are discounts available for bulk quantity purchases! Placecard holders provide many other uses as well. Use a placecard display on a desk at home or in the office to keep track of reminders, photos, mail, or meetings. 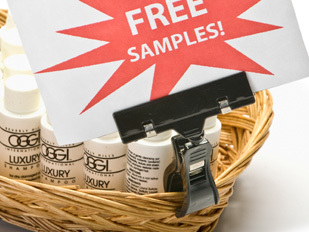 A card holder on a table in a restaurant or food court can advertise special retail events. The unit can prominently hold a picture of a loved one. This placecard holder provides an attractive accent to the tabletop! We feature table accessories in this category as well as in our restaurant displays category. These affordable fixtures are perfect for any occasion! Displays2go offers more than 7000 products. Browse through the main shopping pages to see the diverse selection of fixtures available in this online catalog. From restaurant displays to picture frames and cork boards; shoppers can find exactly what they need for marketing and advertising needs right here! Businesses from several different industries trust this online retailer for all of their promotional display needs. Our warehouses are filled with more than 7,000 unique products! The majority of orders ship fast from one of several domestic warehouses. In stock order requests received before 3PM EST Monday through Friday are shipped the same day! Online chat is available Monday - Friday from 9 a.m. to 5 p.m. EST. Customers may also e-mail an agent with any business related questions. Do you prefer a more personal shopping experience? Call us at 1-800-572-2194. Our agents are here to assist shoppers with orders, large or small. These agents are trained on all the products available here and will help every step of the way. Order these table number stands today!